Version 5 is the final version of the Clinton Administration's White House historical web sites. It represents the web site as it appeared during the last days of the Clinton Administration. Press briefings and radio addresses are included. 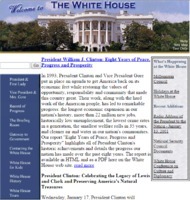 “Clinton Administration Website Version 5,” Clinton Digital Library, accessed April 24, 2019, https://clinton.presidentiallibraries.us/items/show/2584.